An anklet is a bracelet worn around the ankle. Like a bracelet an anklet can be a chain suspending beads and charms, a cuff fitting snugly around the ankle, a semi-circle, similar to a torc, or just about any other circular or ovoid shape. Anklets have been found throughout history in traditional jewelry all over the world. Some anklets carry tribal symbolism and many are used as an adornment to accompany traditional costumes worn for ceremonies or for performing ritual dances. Contemporary anklets are usually composed of a chain with beads interspersed or charms suspended. Anklet with Alternating Diamond-Set Rosettes and Gem-Set Hinged Lockets (or Caskets), Engraved Designs on the Interior, Calcutta. 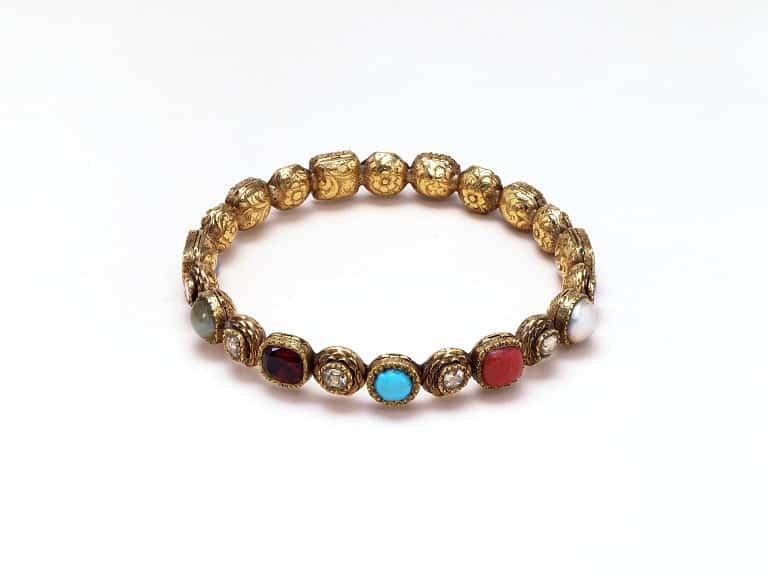 Image Courtesy of the Victoria & Albert Museum Collection.